Pilasters are used to supports roof and floor loads of homes and buildings, projecting from a wall rather than standing alone. Although a pilaster can be constructed from wood or metal, they are most commonly built from cinder blocks. You can install your own cinder block pilaster, depending on your level of experience and the scope of the project, in four to eight hours. Add 1/2 bag of mortar, eight shovels of clean, brick sand and 3 gallons of water to a wheelbarrow. Combine the ingredients with a hoe, pushing and pulling the mixture until you achieve a pancake batter consistency. Allow the mortar to sit for 15 minutes, add 1/4 gallon of water and remix with the hoe. Spread a mud bed on the footer where the pilaster will be placed with a masonry trowel. Since a pilaster is installed as though it is a wall extension, make sure that you place the mortar at the base of the wall in a 16-by-16-inch square. Pile the mortar so that you have a bed 2 inches thick. Set the cinder block into the mortar and gently tap it in place with the handle of the masonry trowel. Set a second cinder block beside the previous block in the same direction, spacing them 3/8 inch apart. Level the blocks with a 4-foot level and make sure they are square by placing a carpenter's square on the outside of the blocks. Spread a 1-inch thick layer of mortar on top of the previously set blocks with the masonry trowel. Set the next two blocks, turning them in the opposite direction as the first two. Tap them in place with the trowel. Place a level vertically and horizontally onto the blocks to check that they are level and plumb. Continue to lay the blocks in a criss-cross pattern as you extend them upward. Once the pilaster has been laid to the desired height, fill in the voids in the joints with a pointing trowel. 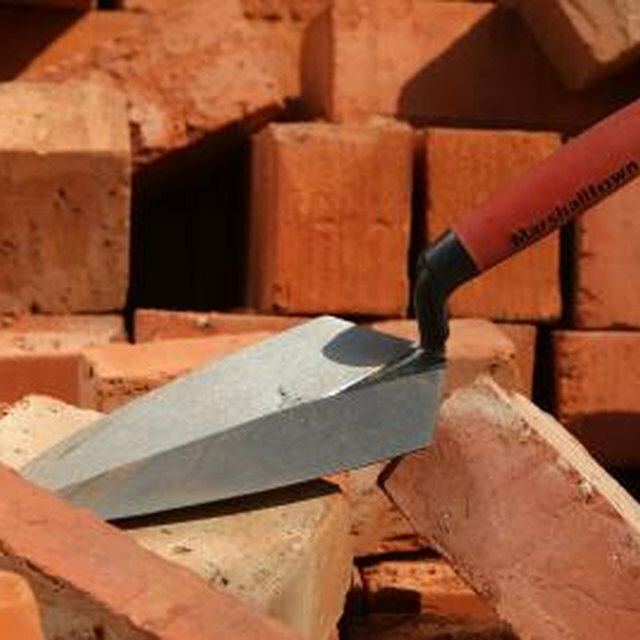 Place a scoop full of mortar on the mason's trowel, hold the trowel against the cinder blocks and press the mortar into the block joints with the pointing trowel. Allow the finished pilaster to sit for 24 hours prior to use.